If you’re looking to speed up your Ticket to Ride games, this is the expansion for you! With this expansion you won’t be using the train cards to claim your routes. Instead, you’ll roll 5 dice which you can immediately use to either claim routes or choose destination tickets (choosing one per station rolled, with the option to discard each one). You can also cash in two unused dice to get a route token that can be used later on if you didn’t roll enough to claim a route. That’s basically it. Since you’ll be able to claim routes almost every turn, the game goes quite a bit faster. You also won’t be holding cards in your hand, which some players like, and others don’t. The downside is that you loose the anticipation the cards bring. Whether the colors you need will turn up, or if the player before you will take the colors you need. You also loose a bit of the player interaction. The rulebook is only a “booklet” because it’s in almost every language. You find you’re an expert in 5-10 minutes. This is definitely an expansion that you could use with first time players. Yes – If you get frustrated with waiting for the colors you need to claim routes, this is a must buy. No – If you like the interaction between players that the cards bring, and having cards in your hand, then this might not be the right expansion for you. In this expansion players still attempt to complete their Destination Tickets and claim routes and block each other on the map. 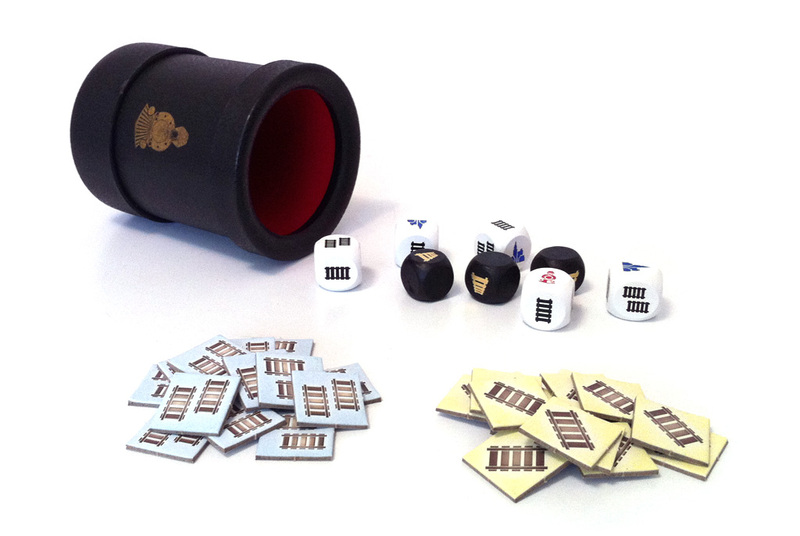 But rather than draw and collect Train cards, they roll five custom Train dice each turn. The great thing about the dice expansion is you don’t have any train cards to mess with, or wait for eternity for! Pretty much every turn each player will roll the right dice to claim a route. The other nice thing about the dice is for each locomotive (wild) or station you roll, you can choose a ticket, with the option of turning them all in if you don’t want them. So you can very quickly ramp up on tickets. Some of my friends are train card purists, but I actually like the lower level of stress that the dice add to the game. And since the regular game is based on the luck of the draw, the dice game doesn’t add to the amount of luck. If anything, I’d say you’ve got better chances with the dice to claim a route, you just have to claim it before the other players do ! The mechanic of TTR the dice expansion is to roll the dice and claim routes based on what comes up on the dice. Do yourself a favor though and print off the rules from the web and try it with just a set of regular dice. Make a legend involving what each pip count means and try it out. It does really change the game and adds a lot more luck factor to it. I just couldn’t justify the price for what you get. This is then the expansion for you. Even though the components here are great looking and the quality is impeccable this does not so much add to the game as takes away from it. You now have faster rounds and less strategy involve. You don’t have to choose what to draw or what to block. It’s all up to the dice. So if you think Ticket is to hard or need faster games, then this is for you. Otherwise, stay away. I love how the dice version makes the game much faster. When I’m tired and don’t feel like a heavy game I know I can get out T2R and the dice and play in about 20 minutes. The dice turn an already great game into a game that’s accessible for those who want strategy but only have a short amount of time. There is no sacrifice of strategy here. Excellent expansion. 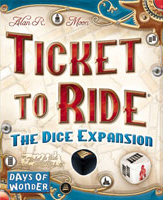 Add a Review for "Ticket to Ride: The Dice Expansion"